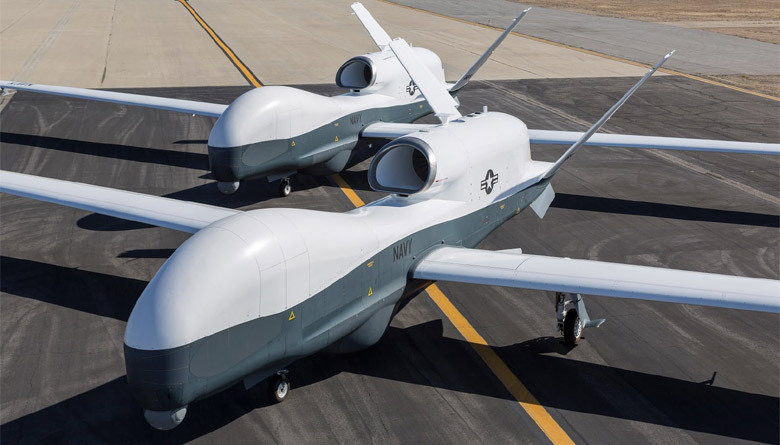 On Tuesday the U.S. Navy said it will continue searching for more alternatives to come up with a system to assist North Grumman Corp’s new MQ-4 Triton high-altitude unmanned spy plane detect and evade other aircraft, and anticipated to decide on new approach within a year. In 2013 the Navy halted work on complex “sense and avoid” radar underway by Exelis Inc after the company went into technical challenges when designing a system small enough to fit in the nose of the drone. The deputy program manager for the Triton program, Sean Burke, told reporters that the triton was making good progress in flight testing and development, although it had proven technical challenges to scale down the complex, 360-degree radar required for the new detector. Burke said that they were taking very hard look for the right way forward, and despite continuing with theirs, they might be taking a step in another direction. Additionally, they expect it within a year although he wasn’t very specific. Exelis confirmed work has stopped on the radar last year but did not comment further. Burke noted that there were no other sensors on the market currently that meet the Navy’s requirement, and that the officials were considering other technology options other than the radar. The new sensor is needed by the Navy to assist other aircraft since operational plans for the Triton requested it to shift from its normal flight altitude of above 60,000 feet to as low as 5,000 feet to take photos and record in areas of interest. Although commercial aircraft don’t fly at the higher altitude where Triton will usually be flying, sensor will give it “eyes in the cockpit” and allow it to navigate to lower altitudes safely. Burke also added that the plane will also need such sensors for certification by the U.S. federal Aviation Administration for broader integration into U.S. airspace. The Navy is planning to have two Triton aircraft in operation in 2017, and four by 2018. They will be carrying out surveillance, although their capabilities will be expanded with time to help them listen for sonar buoys and other signals, and send airborne communications. According to Burke, if the operation has been completed, Triton would have been ideally suited to assist in the hunt of the Malaysian airliner that disappeared a month ago. He said the plane was being tested but could not be used in the global search since cameras and other sensors have not been integrated and flight will be tested until September. Burke said an earlier plane built by Northrop could not be used as it relies on commercial satellites which failed to spot the Missing plane.